Las Navas del Marqués is a small town in the province of Ávila (Spain). 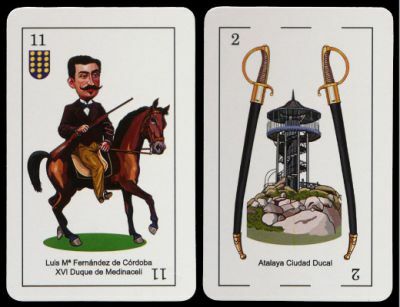 Many cards are illustrated with characters and monuments circa 1860 when the Duchess of Medinaceli or Doña Ángela María Apolonia Pérez de Barradas y Bernuy (1827-1903) ruled Ciudad Ducal. She promoted the local industry and in 1863, she allowed the railway between Madrid and Ávila to cross her land, adding a new station on the way. Note that the Atalaya-Mirador de Eiffel shown in the 2 of Sword had been built in 1873. The illustrations by Fernando Corella have been directly inspired by old paintings and photographies. The suit signs have been adapted: the family coat of arms and the rache tool to scrape the pines replace respectively the coin and the wand. Price and where to find: This pack can be ordered from the artist (www.corelladibujo.com).